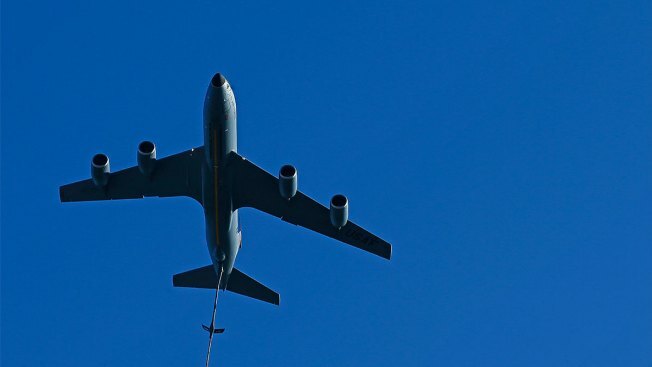 A KC135 from the 134th Air National Guard Air Refueling unit from McGhee-Tyson Airbase does a flyover before an NCAA college football game against Kentucky Saturday, Nov. 10, 2018, in Knoxville, Tenn.
Several retired members of the Air National Guard and the Air Force Reserve say they have struggled to receive their pensions, a problem that military officials attribute to a beleaguered workforce and technology that one former general called "shamefully outdated." Some retirees say they have waited months to receive the financial support and health benefits owed to them after 20 years of service. NBC News spoke with half a dozen former Air National Guard and Reserve members who in the last two years have waited weeks or months past the date of when they expected to receive their pension. Some eventually received their money but had to endure months of no income while waiting.